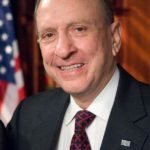 Arlen Specter was an American lawyer, author and politician who served as United States Senator from Pennsylvania. Specter was a Democrat from 1951 to 1965, then a Republican from 1965 until 2009, when he switched back to the Democratic Party. First elected in 1980, he represented his state in the Senate for 30 years. "The best way to reduce the cost of medical care is to reduce the illness." "When the students are occupied, they’re not juvenile delinquents. I believe that education is a capital investment." "I do come from a strong family." "There is no higher value in our society than integrity." "Pennsylvania is a very tough state; people don’t last long in Pennsylvania politics." "Separation of power says the judiciary committee is supposed to confirm qualified judges and then what the Supreme Court does, that is their function, not my function." "It’s inspirational to see someone who is dying smile." "I am very much opposed to abortion personally. But I don’t think it is the government’s rule." "I am opposed to anybody making a decision for you or me or anybody else about what health care plan we should have." "My father was an immigrant who literally walked across Europe to get out of Russia. He fought in World War I. He was wounded in action. My father was a great success even though he never had money. He was a very determined man, a great role model."